The 21Things4Teachers resource supports teachers in integrating technology tools and strategies in order to transform classroom practice. This comprehensive library of just-in-time resources covers basic technology skills as well as critical elements for learning and teaching in a digital world. Designed to be easy to use, the 21 “Things”, or themes, present free resources for classroom technology integration that have been vetted by educators. Each “Thing” provides teachers with application practice, additional resources to dig deeper, and best practices to model implementation. Alongside 21 “Things” are also twelve professional development modules available for teachers to practice and apply the resources and strategies in a self-paced learning environment or in collaborative school or district teams. The modules are designed to be completed in 1-3 hours and include tutorials, additional resources and links to build professional practice and community. 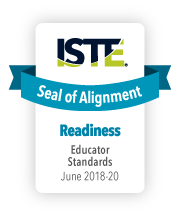 21Things4Teachers successfully underwent the International Society for Technology in Education (ISTE) Seal of Alignment review for Readiness. Reviewers determined this resource helps build foundational technology skills needed to support the ISTE Standards for Teachers. The 21Things4Teachers and professional development modules support continued professional growth in enhancing teaching practice and setting personal professional goals.